Tracking fail. What do I need to learn here? 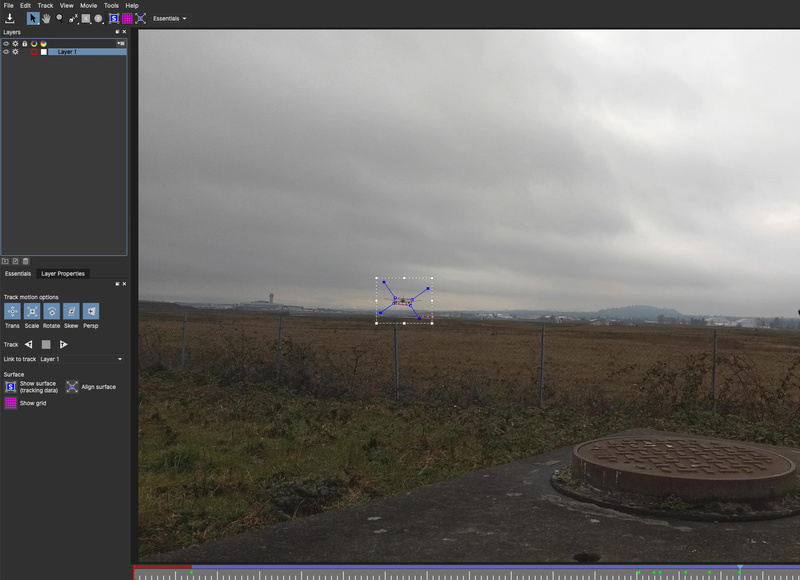 Screen shot of 4k, 30.002 fps footage at ~50% scale. Originally recorded as h264 mp4, transcoded to ProRes HQ. I’m having no luck tracking parts of this footage. One part (a second maybe) I chalk up to bumpiness, where the plane jumps about 1/2 the distance of the pictured bounding box. Is that much bump enough to totally lose the tracker? If so, is there a way to compensate for that with a broader “search area”, as there is with AE’s point tracker? Later on it seems (to me) relatively smooth, but the track just keeps drifting off. Is it oo small of a tracking area? Framerate problem? You can increase the search area in the track tab by increasing the horizontal and vertical search area manually (uncheck the AUTO checkbox and put in number manually) and you can also increase the angle and zoom in the same part of the tracking tab if they change as well. Or I might simply use manual track to jump to the new location after setting a keyframe on the previous frame. There’s more than one way to track a plane in Mocha. Thanks for the tips, Mary. I will spend more time in Classic layout. I fiddled with Search Area and Min % Pixels but honestly I think it was turning off Scale tracking that made the most difference for me. Even so, I’m still confused about the drifting there. Starting over seems to be a good tool I’ll make more use of. This feels like a dumb question, but can anyone recommend a good resource on manual tracking. I’ve come to be skeptical that anything is as simple as it seems. A thorough explanation of the video qualities Mocha dislikes would also be helpful. Most tutorials out there focus on the flashy FX stuff but these basics aren’t always obvious or straight-forward. Also, is there a PDF of the documentation somewhere? I can’t get it to print or save from the website. And luckily, Mocha’s dislikes are easy to find too. Mocha is a texture tracker, at it’s core, so anything that happens to the footage that blows away texture like compression or retiming can really mess with the tracking algorithm, extreme blur and extreme lighting changes too can trip you up. Barely noticeable occlusions and reflections are also something Mocha can see even if you don’t notice it on the first pass of tracking. You should be able to install offline Mocha help as a PDF, let me know if you can not. Exactly the backgrounders I was looking for. Actually I’d already started that manual tracking one but got distracted and forgot about it. Oops. So many vids. I appreciate the links. I notice that you advised someone else that offline help was installable via “Help > Offline Help” but I don’t see that option. What’s the REAL secret to it? I am pretty sure in the most recent versions you have to install the offline help when you actually install th program, let me check with @martinb who will definitely know. I don’t want to tell you the wrong thing. I don’t recall having an option to even install Mocha AE, let alone the docs. Could be mistaken, of course. I do hope I can get it somewhere, though. You’re absolutely right about Ben’s tutorials. I bought “More than the essentials” and it’s excellent. Before I go through it a second time maybe I’ll check out some of the freebies here. OK! Let me see what I can find for you re: PDFs. If you want to get the offline manual, just disconnect from the internet. By default we always link to the web help as it can contain immediate fixes that we would otherwise have to wait for a release to update. When you are not connected to the internet, we bring up the PDF version offline.